Porvair Filtration Group offer the most complete range of porous materials for gas/liquid contact applications across a variety of industries, including food, beverage, waste and water treatment, chemical process and pharmaceuticals. As a manufacturer of porous media and elements we are able to specify, design and manufacture the most efficient product for a given application. The key to efficient gas transfer is to generate very high volumes of fine bubbles. It has been shown that a 1mm bubble has 6 times the gas/liquid contact than that of a 6mm bubble. Therefore, we recognise that bubble size is essential to optimise mass transfer and reduce gas consumption and energy costs. Our sparging elements are designed and manufactured from uniform, fine, controlled pore size media to achieve excellent performance in the distribution of a large number of small gas bubbles for a higher interfacial area. Spargers can be used in intrusive and non-intrusive tangential pipelines for the treatment of wastewater, volatile stripping and steam injection. They can also be used in tank applications for fermentation, agitation, bioremediation, oxygen stripping, de-watering and dissolved air flotation processes used by major oil companies. The high quality, all-welded robust construction of these products ensures easy cleaning and provides temperature and corrosion resistance. Features and benefits of this technology include a rugged fixed pore media, a wide range of available media pore sizes which in turn has the ability to control the bubble size, higher diffusion rates from smaller sparging elements and sparger diameter and connectors designed to meet application requirements. 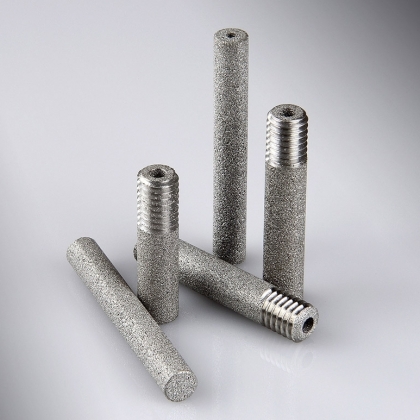 Elements are available in Sinterflo® sintered porous stainless steel, Vyon®, sintered porous polyethylene or polypropylene. Stainless steel spargers are supplied in stainless 316L and higher alloys such as Inconel® and Hastelloy® for very aggressive applications. Being manufactured from such resistant materials, Porvair spargers are cleanable and if necessary heat or steam sterilisable. Depending on the system parameters, we design using mesh, metal fibre or metal powder sparging media for optimum economics.